Looking for a place to hold your birthday party or special event, we offer a banquet room for your special event. We are Mechanicsburg's best pizza shop since the early 70's. Family-owned and made from scratch every day. Delicious pizza, pasta and subs! Now featuring gluten free pizza. We have an extensive menu of pizza, pasta and subs and offer a unique dining experience. 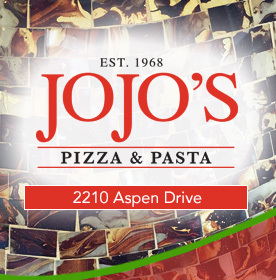 When celebrating your next event, think JoJo’s Pizza & Pasta. For business meetings, receptions, or any special events, our banquet facility can entertain up to 80 of your guests with fully catered trays of delicious Italian cuisine. At JoJo’s we strive to accommodate. When you think fundraising, think JoJo's Pizza & Pasta for your organization or school event. With our ample dinning room, talented staff and delicious Italian food, we are sure to make your fundraiser successful and have people coming back for more! We are available to host fundraisers Tuesday, Wednesday and Thursday. Your organization will receive a 10% kickback from the total receipts of fundraiser tickets. "All dishes are house-made with fresh ingredients." © 2019 JoJo's Pizza & Pasta. All Rights Reserved.